Observations: Does America have free speech, or only “sometimes free speech”? Does America have free speech, or only “sometimes free speech”? Recently, more words have been added to the list that our betters say we can’t use anymore. Most recent is the word “thug,” following the riots in American cities after the deaths of African-American males in confrontations with police officers. News reports describing broken windows and looting of some businesses, burning buildings and cars, etc., by some of the rioters contained that word in what clear-thinking people would accept as accurate useage. But it immediately was labeled a no-no, because some had decided that it was being used to replace the “N” word. That, of course, falsely assumes that the only people who behave like thugs are black. One of Hillary Clinton’s support groups virtually dared media folk to use any of 12 descriptive words in discussing her, because doing so, they say, is sexist. What these folks, so quick on the trigger to ban words they don’t like, forget is that here in America millions of us take the First Amendment’s guarantee of free speech seriously. Just because you are offended by something someone said, you don’t get to dictate what people can and cannot say. And now the Garland, TX event that resulted in two Muslim extremists getting their just desserts before they could murder participants and the event’s sponsor, Pamela Geller, has ignited a furor over whether the Muhammed Art Exhibit and Contest event crossed the boundaries of free speech. Ms. Geller’s critics say “yes, she has the right to have this contest, even though it is highly offensive to Muslims, but she should not have had the contest because it drove those two Muslims to violence.” Translated into plain English, these critics are saying, “If someone might react violently to what the First Amendment guarantees you the right to say, you shouldn’t say it.” And, they imply that the two now-dispatched murderous Muslim thugs aren’t the ones who did wrong, Ms. Geller is. In that realm of illogic, what is or is not legitimate free speech depends upon how someone might react to it, and the speaker is responsible for how some maniac might react to what he or she said. That standard, if adopted as law, would lead eventually to darned near everything being ruled improper speech, because these days being offended now rivals baseball for the title of National Pastime. For those ignorant of the founding principles, a refresher on why there is a free speech clause in the First Amendment might be useful. Since no one cares about restricting speech that they like and approve of, the First Amendment must have been created for a different purpose. 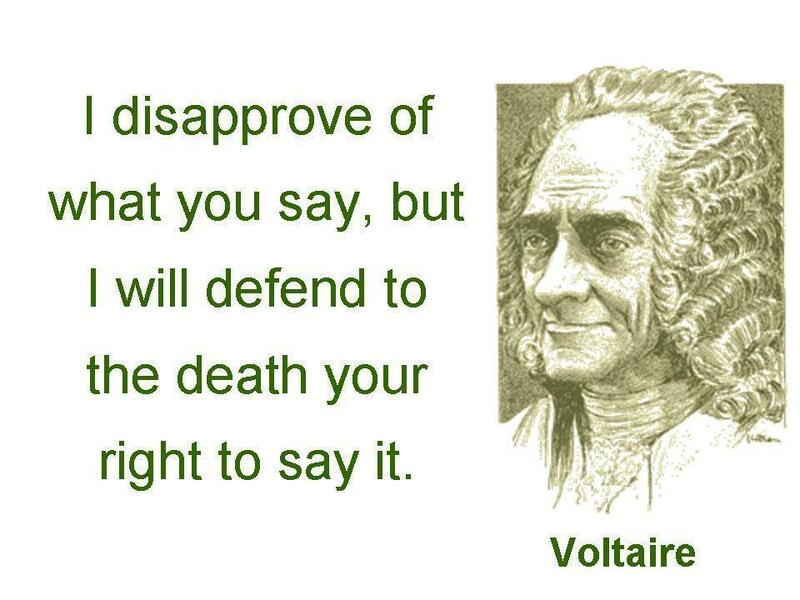 Its purpose was to guarantee the people the right to say pretty much anything they might want to say, however unpopular, vile or hurtful it may be to some. Specifically, the right to speak against government and those involved in it was high on the list. Imagine the futility of declaring independence from an oppressive master, fighting a bloody war to achieve independence, and then not providing mechanisms that guarantee that the citizens of the new nation can think and speak like the Founders did. Where religion is concerned, consider that Andres Serrano received $20,000 of taxpayer support from the National Endowment for the Arts for the “work of art” titled “Piss Christ,” a crucifix sitting in a container of urine. Millions of Christians and others condemned this as highly inappropriate, but no one tried to kill him, or to rewrite or redefine the First Amendment. Contrast that with renderings of the prophet Muhammad, whom the Encyclopedia Britannica said was “founder of the religion of Islam, accepted by Muslims throughout the world as the last of the prophets of God.” The episode in Garland, TX, the Muhammad Art Exhibit and Contest, where two Muslim men took exception to the idea of using Muhammad as the subject of art works and showed up with assault rifles, stands in sharp contrast to the Piss Christ episode. There are some exceptions to free speech, among them the commonly cited “shouting ‘fire’ in a crowded theater,” which would spark a panic that would likely hurt people. Drawing pictures of Muhammad, however disgusting they may be, or calling thugs “thugs,” or using certain words to describe Ms. Clinton fall well short of that threshold. We cannot and will not allow self-appointed censors to cleanse the lexicon of imagined offensive thoughts and words, whether the goal is to protect a political candidate, or because certain words or deeds are likely to offend someone. The United States has not survived and thrived for more than 200 years by letting a bunch of ideological nannies control their every word, thought and deed. We should expect and encourage people to use good judgment in their words and deeds, but we cannot persecute them when their legal behavior strays beyond our preferred boundaries. The United States has its way of doing things that has worked well for a long time, including guarantees of free speech, freedom of religion, and other important individual rights. Those principles are not going to change every time a small, disenchanted group wants a change.